Synthetic turf sports fields serve a much-needed purpose of consistency for play in all weather in addition to the many artificial turf options for recreational areas and landscapes. This is why it’s now more important than ever to understand the differences between the turf infill options. Installed in over 60 full-size fields and hundreds of landscape applications, America’s original organic infill is still the one you can trust! The mandate at Greenplay Organics has always been to elevate the benefits of artificial turf with a plant-based, natural infill system utilizing only pesticide-free organics as the best synthetic turf infill to integrate with the natural environment. Utilizing only the highest-quality and specially sourced materials that nature provides will enhance synthetic turf with a proven natural “technology” that is rigorously tested to the highest international safety and performance standards. Safety is built in with an enhanced fiber matrix in our Corkonut turf filler designed to provide optimal uniformity and stability within the turf system much like a natural root zone to eliminate migration and fly-out even with heavy use. Turf abrasion is reduced almost to the level of natural grass and G-Max impact forces are reduced by virtue of the added cork infill. The moisture efficiency of our Corkonut artificial grass infill is optimal and can provide grass-like temperatures by absorbing 150 times its weight in water before cycling through a turf cooling, natural evaporation process that mimics natural grass. Yes, you can play barefoot on artificial grass! 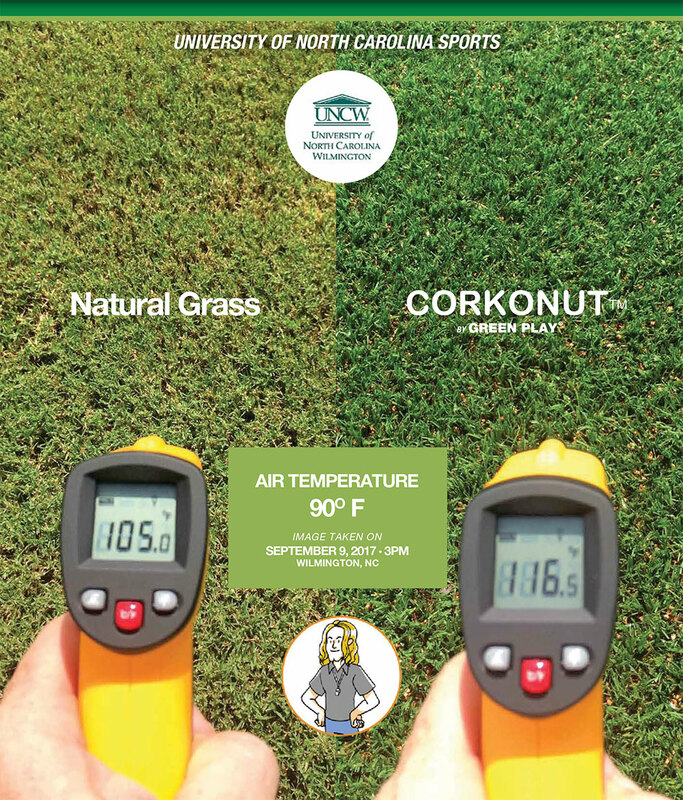 Corkonut® provides the lowest artificial turf/infill system temperatures by far and the closest to natural grass. 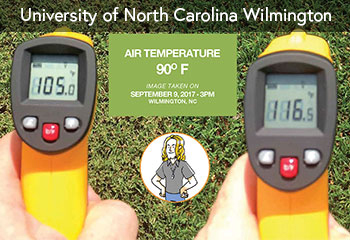 Surface temperatures are significantly cooler than with any other type of sand, rubber or plastic infill. Core temperatures which establish the long term cooling effect throughout the day have been proven with Corkonut® to be even lower than natural grass. Testing validates that a sports turf system with Greenplay Corkonut® offers performance and safety on par with pristine natural turf grass to reduce the incidence of injuries, concussions and abrasions. It enhances foot stability, rotational resistance and energy restitution to meet or exceed all FIFA requirements. Ball control, direction and bounce remain true for the athlete. Try this with any other turf infill! The coconut fibers in Greenplay® are unique and specially sourced from our partner growers. This proven blend of coconut husk and cork forms a powerful matrix within the turf to provide an extremely stable sports surface rivalled only by natural grass. Infill displacement and fly out are virtually eliminated while consistency of play is maximized. The organic matrix will remain stable even in a heavy rainfall, remaining 100 percent playable rain or shine. This highly permeable infill system is tested with a flow rate of > 36" per hour. Developed for long life and tested under the most extreme conditions, Greenplay® Corkonut® exceeded all expectations after an intense impact study by a third-party test lab. Subjected to 1,000 repeated impacts by a 20-pound missile from a height of 2 feet, the change in the granulometry was minimal with an average variance of 2 percent and a bulk density increase of only 0.001g/cm3. You don’t have to be a lab technician to realize these are incredible results for an organic material! Natural technology powers the engine within the Corkonut® infill system much like the same way it does for natural grass. Greenplay’s unique coconut husk fibers have a larger internal diameter and thicker walls that retain and store additional moisture for a longer period before gradually releasing it as part of an evaporation cycle. The coconut fibers naturally absorb moisture from the air resulting from ambient humidity, rainfall or irrigation before slowly releasing the moisture into the air and literally cooling off the synthetic turf fibers. Your investment dollars will be truly GREEN. Not only is Greenplay® Corkonut® an investment in safety, it is also a long term investment in the environment. The field's end-of-life costs will be greatly minimized since the organic material can be utilized as a top dressing for natural grass or tilled into the planting soil, never having to leave the site. It is 100 percent environmentally sustainable, recyclable in nature and eliminates disposal costs, making it a natural investment for your children.